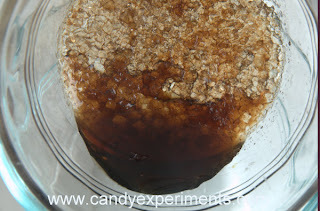 The sugar has formed into clear crystals, with a molasses-like liquid beneath them (you can see the brown puddle at the bottom of the tipped bowl.) But why? It turns out that brown sugar isn't much different from white sugar. In fact, most brown sugar is just white sugar with a little molasses added. When you dissolve it, and let it recrystallize, the sugar molecules crystallize together, concentrating the molasses flavoring in the remaining liquid. The crystals have only a tiny molasses taste, which comes from the molasses coating I wasn't quite able to rinse off. If I could clean off the crystals before I tasted them, I'd be tasting pure sugar. 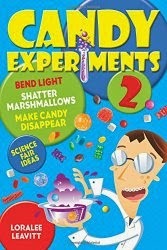 When I tell people I do candy experiments, they always ask if I make candy. My answer is always no. It's way more fun to take it apart!